Morgan Kolukisa writes a counterpiece to an Op-Ed written by three professors at the university. These professors claim that the removal of these posters by UDPD officers violates the right to free speech of those who placed them. They argue that these posters were only allegedly a part of a white nationalist campaign, that the UDPD are becoming “thought police,” that this is comparable to Professor Richard Aumiller being fired in 1976 for supporting homosexuality and that the email students received does not line up with what the university spokeswoman relayed to the press. I respectfully disagree with all these claims. While I understand that people will always have different opinions, I believe that this op-ed was misguided in its efforts. 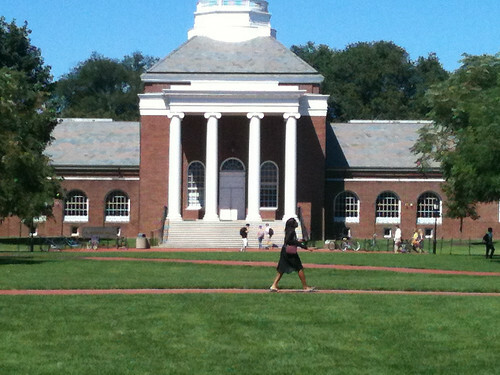 Posters like the ones found on the university’s campus were also found at Montgomery Blair High School in Maryland, the University of Vermont, Champlain College, Tufts University and others. The university’s response was not based on petty political preference, but rather the actual danger of intimidation that these signs represented. This was a deliberate, organized effort, which has been seen on campuses across the country, not just at this university. UDPD taking down these posters was not an attempt to become “thought police,” but instead was the reasonable enforcement of campus policy, and part of a continued effort to establish an environment where all students feel safe. The comparison between this event and the firing of Aumiller is similarly misguided. Aumiller was fired because of his public support of homosexuality in a time not long after the Stonewall Riots, when the Gay Rights Movement had not yet made the strides many students and faculty on this campus benefit from today. Aumiller’s firing was a deliberate act of discrimination, and is in no way comparable to the removal of these posters that contained a message that is potentially harmful to some of the university’s students. The authors comparing this support of homosexuality to a phrase that is heavily associated with the white nationalist movement is horribly homophobic in a manner I am horrified to see from the university’s faculty. This comparison equates supporting homosexuality to supporting a movement intent on putting people of color, members of the LGBTQIA+ community and anyone of a differing faith into a lower social standing, if not their outright removal from society. This is an extremely harmful dialogue to begin, as it makes it seem as though these two things are similar or truly equivalent, as if the LGBTQIA+ community should have to debate its very existence as acceptable. The article also makes the point that in the email students received, it was made clear that the posters were removed from campus because of the message they displayed, while the university’s spokeswoman told the press they were removed because permission is needed to hang anything on campus. Why must these two things be mutually exclusive? Why is it something to be looked down on that the university wanted to assure that it does not support a white nationalist movement? The university used this email as an opportunity to reach out and let its students know, especially its students of color, or students otherwise negatively affected by the white nationalist movement, that the university is looking out for them and is concerned about their feelings of safety on campus. Frankly, it’s shameful that these professors seem to put the preservation of these posters over the preservation of a feeling of safety for their students. The professors who wrote this piece center their argument around the American right to freedom of speech. This does not mean, however, that the university should blindly allow speech that seeks to harm members of its community. The right to freedom of speech means that the government cannot regulate our speech or our use of the press to make that speech known, not that Americans have the freedom to use a college campus as a vehicle to begin hateful rhetoric. The university has the right to choose what kind of culture it cultivates for its students. Choosing to attempt to create a peaceful, safe environment for its minority students is something that should be commended. The university is right in being specific about what kind of culture it cultivates. As history shows us, the allowance of hateful and violent viewpoints can have dire consequences for marginalized members of those communities. The university is doing its job of making its students feel safe, and doing its part in attempting to maintain a positive environment for minorities in our community. It’s contemptible that not all of its professors are doing the same. Morgan Kolukisa is a sophomore English major at the university. She can be reached at kolukisa@udel.edu. 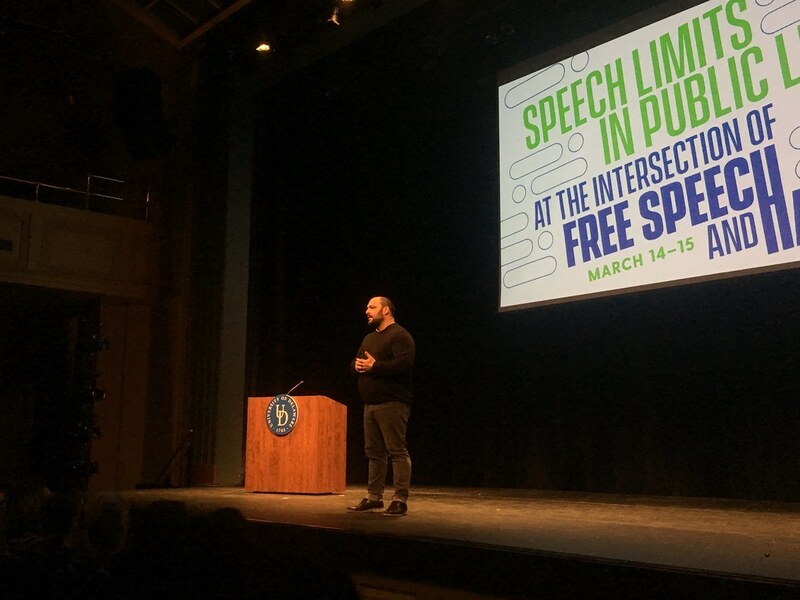 Christian Picciolini lectured Thursday night on how to better understand and combat the cultural zeitgeist of ethnic supremacists and other hate-based groups. I’m glad to hear you would also support the UDPD removing “it’s ok to be Black” signs! Enjoy your day! Typical racist troll response. I’d leave an intelligent reply explaining the difference but you are clearly too ignorant to understand it. I don’t care if you enjoy your day or not. Where did you hear that? There is no mention of your racist statement in the article above. Perhaps you need to give it another read. How sad is it that a goddamn sophomore has more intellect than three “well educated” adults.